Lana the fabulous boss lady of CIS has organised a night of scrapping,comps,prizes,chatting and fundraising for Breast Cancer research.$1 from each classkit/access purchased for Kerryns class will be donated and Laura has created a class kit and she is kindly donating $2 for each kit sold and I have donated some of may handmade flowers as a prize on the night too :D I think its something that all women and girls should be aware of and every little bit towards finding a cure helps us all. 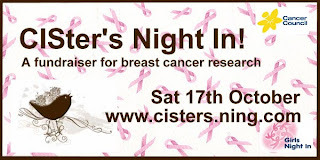 My gorgeous friend Kirsten is a breast cancer survivor and she is the most amazing person *mwah* you are awesome lovely :) If you are reading this you know I think you are fandabbydosey :) So come on girls come and join us on the night everyone is lovely and I know you will have a fab time! Just a little sneak (you can see the full image on Friday when I show the full LO :D) I used my new branches of blossoms in pale blue,small roses in ice blue (NEW) and olive green I think they look devine with the awesome websters pages Lana sent me from the CIS store *mwah* thanks Lana!